As with many great hotels, the success of Selman Marrakech stems from a family history. The hotel’s owners, Saida and Abdeslam Bennani Smires, are fulfilling their grandfather’s dream of seeing the family create a successful business in his hometown. Educated at a hospitality management school in Lausanne and with a keen interest in Arabian thoroughbred horses, Abdeslam is a young man driven by his endless enthusiasm. In 2005, he launched a project to combine his two passions within an extraordinary hospitality concept that would set new benchmarks in the travel industry: Selman Marrakech. Selman Marrakech is a truly unique project that would not have been possible without the support of Abdeslam’s parents and, most of all, his sister Saida, who brings a calmness and pragmatism to proceedings. With their complementary characters, Saida and Abdeslam have managed to create a hotel that echoes their differing personalities, as well as their family history. European CEO spoke to Kamil Ennadifi, General Manager at Selman Marrakech, about what makes the hotel unique and why Marrakech is such an attractive business destination. 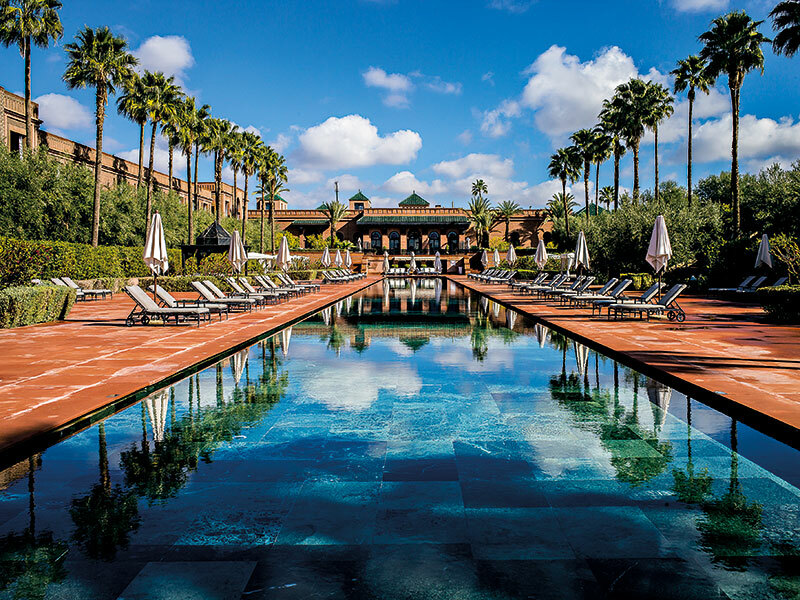 What makes Marrakech a good destination for a luxury hotel like Selman? The local climate is a big selling point. Marrakech benefits from more than 340 days of sunshine per year, and while it is true winter can bring cold nights, it remains mild during the day. What’s more, this climate has helped sculpt Marrakech’s beautiful landscape, which has attracted the world’s best painters and photographers for decades. Being within just a short three-hour flight of many key European capitals, the city is also perfect for short breaks. Marrakech’s wealth of culture further adds to its attractiveness. The city’s old town – or ‘medina’ – and its many souks are complemented by a new generation of modern-art museums, including the Yves Saint Laurent Museum. It’s fair to say that Marrakech is truly a combination of tradition and modernity. It is also a dream destination for golfers, with 13 world-class golf courses available. Finally, Marrakech is considered to be one of the safest places in Africa and the Middle East. Why is it so important that Selman is a family-run hotel without affiliations to any hospitality chains? The fact that Selman Marrakech is a family-run hotel is what makes it special, and we are keen for guests to feel as though they are at home. As such, Selman Marrakech offers the perfect mixture of Morocco’s famous hospitality and top-class service – without being too formal. With 50 rooms, five suites and five private villas set over six hectares of landscaped gardens – which also include our impressive 80m-long pool – Selman Marrakech is a true oasis where each guest can live in total privacy. Importantly, our staff are attentive without being overbearing. As a result, we have been able to attract a lot of repeat custom, and guests always report that what makes our hotel stand out is the personalised service. Although the famous designer Jacques Garcia took care of the hotel’s design, the owners’ views were also taken into consideration. The Bennani Smires have also incorporated their favourite pieces of art, adding further to the hotel’s distinctive atmosphere. Where did the idea of housing Arabian thoroughbreds come from, and how was the breeding programme started? Abdeslam has had the privilege of combining his two passions at Selman Marrakech: hospitality and horses. The hotel contains a live installation of the most beautiful breed of horse in the world, the Arabian thoroughbred, which is an integral part of Moroccan history and culture. Abdeslam has been able to visit the most beautiful hotels and stables in the world. It was an incredible experience for him, so he wanted to be able to offer other people the chance to share in this otherwise closed equestrian world, where access is normally only conferred through the invitation of horse owners. He wanted the guests to be able to enjoy the experience in all its glory and, in doing so, show them the principle of sharing that is so dear to the Moroccan people. The breeding programme, which is called Selman Arabians, was initiated at the same time as the hotel project in 2005 and is inextricably connected to it. 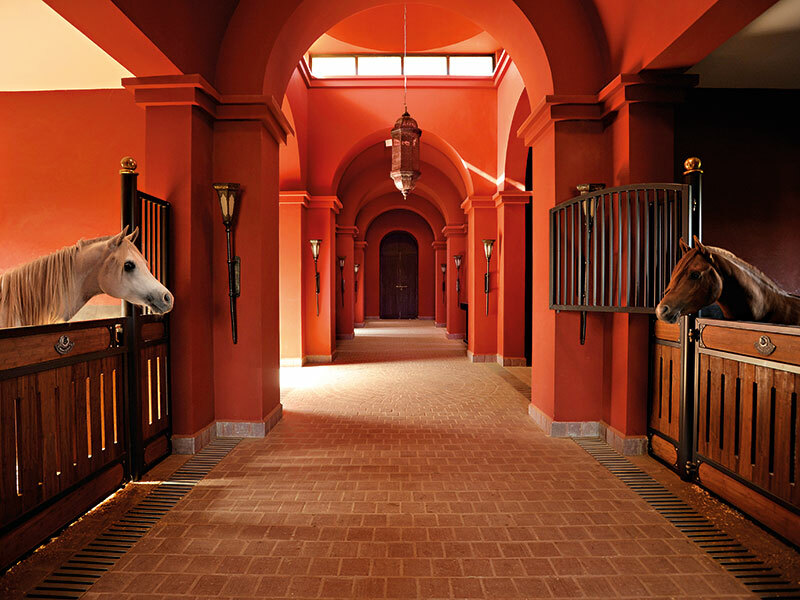 The stud farm is located on our 30-hectare property in Rabat, where more than 30 Arabian thoroughbreds are housed. The aim is to command a starring role within the international equestrian scene – something that we are on track to achieve, with many of our horses having won international beauty awards. How do customers respond to their experiences with the horses? Our guests are delighted to spend time with the horses and are given several ways of doing so. While some just like to see the horses roaming in the paddocks, others prefer to enjoy our shows, which take place on Friday evenings in front of our Moroccan restaurant, Assyl, and every Sunday during brunch. The latter is an experience offered by no other hotel in Morocco. Other guests enjoy the opportunity to ride the horses across the property. Our riding expert, Sadek El Bahjaoui, offers an amazing selection of experiences where people can ride easily, even if they are beginners. What is the Chenot method, and how does it differentiate Selman’s spa from others? Nestled in the heart of the hotel, our Espace Vitalité Chenot Spa is unique within Morocco. With an area of 1,200sq m, this wellness centre boasts an oriental-inspired spa that resembles the hammams of ancient Istanbul. Arranged around a heated central pool, Espace Vitalité Chenot has seven treatment cabins, four hydrotherapy cabins, a jet massage pool, two outdoor heated pools, two steam rooms, a fitness centre and a spa shop that sells products from the Chenot range. We offer treatments inspired by the world-renowned Chenot method, just as they are practised at the Henri Chenot Centre at Palace Merano. This concept of health focuses on the principle of ‘biontology’, which is based on understanding the evolution of the human body’s vital resources at different stages of life. The Chenot method benefits from 40 years of experience and aims to rebalance the body by helping to rid it of toxins. Through a personalised care programme, it restores the body’s wellbeing. Beyond the relaxing treatments, Espace Vitalité Chenot offers detoxifying, energising and regenerating programmes, as well as a weight loss initiative that lasts between three and 10 days. Depending on the needs and requirements of the guest, the Espace Vitalité Chenot team can perform and establish specific therapeutic interventions to act on specific areas of the body, working against cellulite, localised fats or cellular ageing by stimulating natural collagen production. Our Chenot-trained therapists make it a point of honour to offer individualised treatments that, combined with the idyllic setting, promote relaxation and wellbeing.